JUVÉDERM™ Ultra Plus injectable gel temporarily adds volume to facial tissue and restores a smoother appearance to the face. JUVÉDERM™ Ultra Plus injectable gel will help to smooth moderate to severe facial wrinkles and folds. 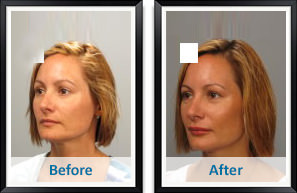 Most patients need one treatment to achieve optimal wrinkle smoothing, and the results last about six months. Most side effects are mild or moderate in nature, and their duration is short lasting (7 days or less). The most common side effects include but are not limited to temporary injection site reactions such as: redness, pain/tenderness, firmness, swelling, lumps/bumps, bruising, itching, and discoloration. As with all skin injection procedures there is a risk of infection. Are there any reasons why I should not receive JUVÉDERM™ Ultra injectable gel? What should my physician advise me about? The following are important treatment considerations for you to discuss with your physician and understand in order to help avoid unsatisfactory results and complications. If laser treatment, chemical peeling or any other procedure based on active dermal response is considered after treatment with JUVÉDERM Ultra Plus injectable gel, there is a possible risk of an inflammatory reaction at the treatment site. JUVÉDERM™ Ultra Plus injectable gel should be used with caution in patients on immunosuppressive therapy, or therapy used to decrease the body’s immune response, as there may be an increased risk of infection. The safety of JUVÉDERM™ Ultra Plus injectable gel for use during pregnancy, in breastfeeding females or in patients under 18 years has not been established. The safety of JUVÉDERM™ Ultra Plus injectable gel in patients with a history of excessive scarring (e.g. hypertrophic scarring and keloid formations) and pigmentation disorders has not been studied. What should my physician warn me about? The safety and effectiveness of JUVÉDERM™ Ultra Plus injectable gel for the treatment of areas other than facial wrinkles and folds (such as lips) have not been established in controlled clinical studies.